This story was originally published at www.kclu.org. Listen to the story here. There’s an effort across the country to encourage students to pursue the fields of science, technology, engineering and math because there are plenty of job opportunities in those industries and not enough people to fill them. But, a South Coast university is going one step further. The university is targeting students from underrepresented groups. Students and professors hike up Mountclef Ridge and through Wildwood Park in Thousand Oaks in the name of science. They’re exploring nature -- jotting down notes and snapping photos of the plants and animals they encounter. “You want to know why does nature do that, how does nature do that. And you just want to know why, and I’m one of those people who wants to know why because I’m a curious person. And biology has those answers,” said Amir Mejia, who will be starting California Lutheran University in Thousand Oaks this fall as a freshman majoring in biology. He’s one of 37 underrepresented students enrolled in this Science Technology Engineering and Math or STEM Academy. “Since I’m first-generation, low-income and Hispanic, I’m not exposed to much resources until I met these people and they introduced me all these information that I’ve never been exposed to at my high school. I’m really thankful that I actually have this opportunity of STEM Academy to explore these possibilities,” he said. It’s a free three-week course funded by a portion of a $4.6 million federal grant. The Academy is geared towards STEM students starting Cal Lutheran as freshmen or transfers to give them a jump-start to college. 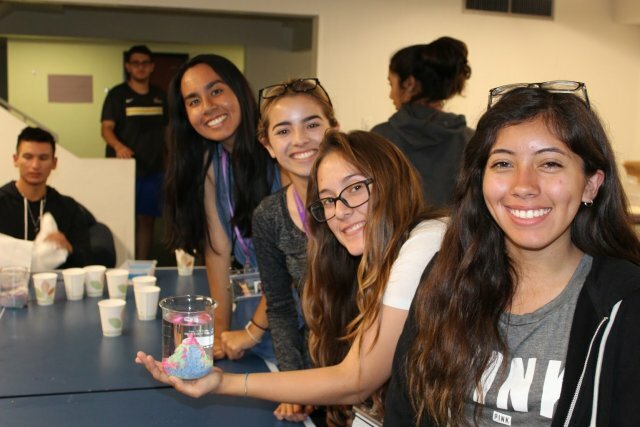 “The STEM Academy serves as a bridge program to help students start Cal Lutheran with all the hands-on skills for working in the laboratory, STEM courses as well as starting to build community amongst each other,” said Lorenzo Ramirez, who’s the director of the program. He said the Academy is composed of those underrepresented in the STEM fields – including Hispanics, African-Americans, women and low-income students. The students are gathering information about the different ecosystems that they’re exploring on this hike. It’s part of a project in which students will use math modeling to design a more drought-friendly campus. “I learned that really life thrives anywhere. It’s pretty amazing. The cacti that’s up there provides living environment for different birds, owls and insects. So, it was really neat,” said Jimmy Newell, who will be transferring to Cal Lutheran this fall as a junior majoring in math. He says the Academy is inspiring. “The most important thing is it just helped to incite that excitement in me for my field because a lot of people think of the sciences and math subjects as something boring, but I want to change that,” said Newell. In addition to this ecology-math project, students will also be investigating an unknown compound and measuring the physics of human-body catapulting. Michele LeBlanc, a biomechanics professor and one of the Academy’s faculty advisors, says the students are getting hands-on experience. “This is really an awesome opportunity for these students. As emerging scientists, they’re getting really a realistic view of what science looks like. And sometimes that doesn’t always happen in a formal classroom,” she said. This is Cal Lutheran’s first STEM Academy. There will be one in each of the next four summers with the goal of continuing to motivate the underserved to pursue STEM careers. CLU is the parent of KCLU Radio.